Launching a website is simultaneously an exciting and terrifying thing. 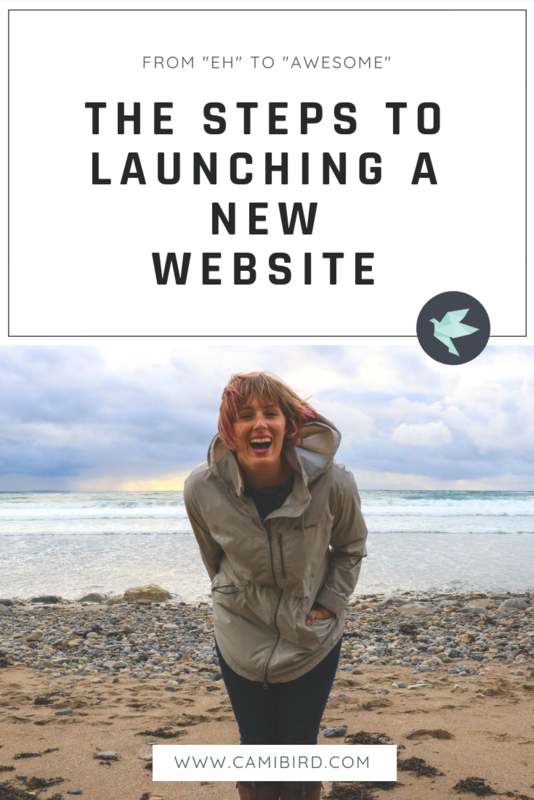 I have launched (taken live, shared new websites - whatever you want to call it) countless websites at this point in my career and I expect I'll continue to launch more, but no matter how many websites I launch with clients or for myself (I'm on number 3 here), the nerves never dissipate. Today I am launching my site once again. After a 3 month hiatus, business restructure, and personal reflection I am proud to share my new path. Good question! When I first launched my website it was to generate a new job for myself. I was unhappy in my position as a Content and Social Media Manager for a corporate company that treated it's employees like cattle and eventually laid me off because I have the audacity to ask for a raise (which I truly deserved for the amount of work I was doing, let alone the quality of work I was doing). This led me down the path of working with entrepreneurs and small businesses who needed some expertise and guidance when it came to their website and their marketing. I figured money was money and marketing was marketing and I already enjoyed working with small businesses and helping see their passions come to life through marketing. So I started building websites for others and contributing to their marketing. But I made my first big mistake - I didn't think through what I wanted beside money. Dax Shepherd has this hilarious podcast, The Armchair Expert, and in one of his podcasts he discusses creating these monetary goals and when he reached them, they didn't feel good enough. That's a little how I felt with my "money is money" goal. It's safe to say, my incredibly simple and non-measurable goal was not good enough to help me feel happy, satisfied and passionate about my work, even though I worked this way for a few years! I create a course for another company I work with, 3 Step Solutions, called Overwhelmed to Online in 30 Days, where I helped entrepreneurs who want to create a thriving business online move past that overwhelm and create a brand, business goals, and website that can grow with. The course launched in July and it's around that time that I realized I wasn't doing that in my own business. I was still just trying to find a full-time job I could do remotely and feel comfortable in because I never wanted to be a freelance marketer, but I just fell into it. The summer of 2018 allowed me to truly take my business into my own hands, thinking through my goals, my audience, my services, and truly developing a business and marketing strategy I'm passionate about. Combining work and enjoyment into something that I can make money in. I am incredibly frank in my experience and expertise and while I would like to consider myself an expert in all things digital entrepreneurial enterprises, I simply cannot. I am not an expert in all things. But I am an expert in some things. I could add more to that list, but these are also the things I like being an expert in and hope I can work with you on. If you're ready to establish yourself as an expert in your field, whether you're a doTERRA Wellness Advocate or a local coffee shop, I hope you'll take a look. You can re-evaluate your business at any stage you're currently in, don't think so, take a look at me!